You can Contact Us anytime using the simple form on the right of our page. It only asks for you contact information and what you would like built. - All contact information is kept securely and accessed only by your Lead Builder. If you're ready to share your backyard dreams with a person, give us a call. You can talk to one of our Designers personally at (830) 428-2999. 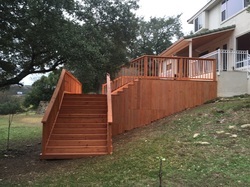 When deciding to build a Privacy Fence, Custom Deck , Pergola, or installing a custom Automatic Gate in Boerne, why not contact a company that has years of experience and a portfolio to brag about. You can reach us on the phone Monday - Saturday from 8am -6pm. Sometimes, all of our workers are out on jobs, so please feel free to leave a message - or leave us a message using the Contact Form. Either way, we would love to hear from you to begin planning your next Extravagant Backyard Project.